Lanbi Call tonight with Timothy T Schwartz, Ph.D., author of "The Great Haiti Humanitarian Aid Swindle"
Thought I'd share this interesting conversation taking place tonight. Dr. Schwartz' findings are exactly why I have been saying: do NOT donate to Western NGOs or missionaries in Haiti. On Monday, May 22, 2017, co-hosts Roger Leduc and Kim Ives go behind the news to analyze recent developments in Haiti on the bi-weekly radio show "Lanbi Call" on WBAI 99.5 FM in New York City, and over the Internet, live or archived, at www.wbai.org. Flash: Haitian TPS extended for 6 months!!! Roger and Kim will talk to anthropologist Timothy T Schwartz, Ph.D., the author of The Great Haiti Humanitarian Aid Swindle. The inside story of how some of the world’s most respected humanitarian aid agencies have deceived and manipulated the overseas public regarding what is really happening in Haiti. Join us this Friday night at 9PM for another engaging discussion! Hour 1: Daniella Bien-Aimé of The Bien-Aimé Post interviews Daniel Jean-Louis on his book From Aid to Trade. 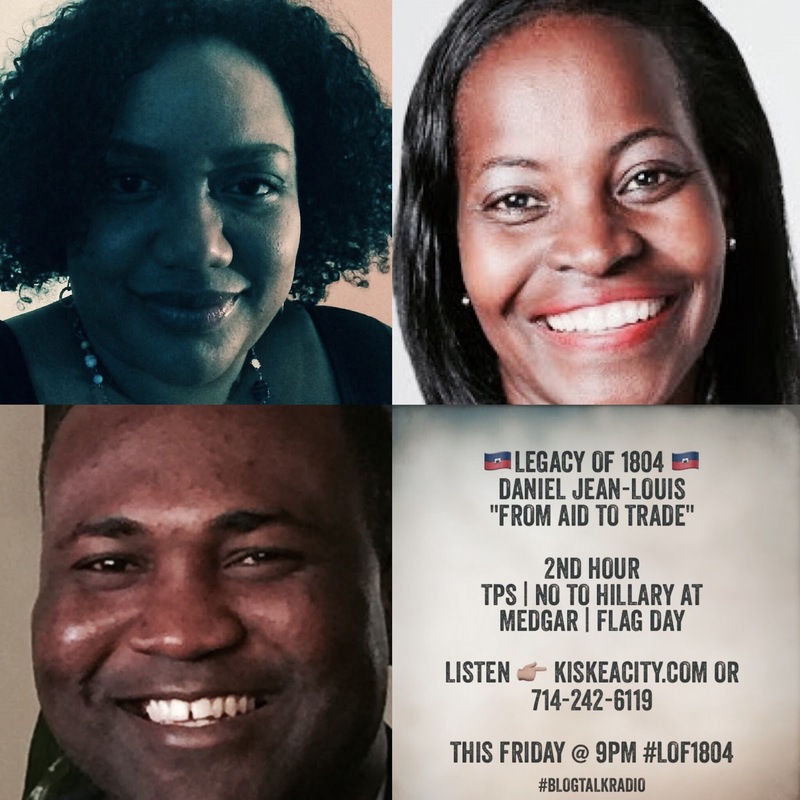 Listen live or archived right here at kiskeacity.com on the below player or at http://www.blogtalkradio.com/pancaribbean/2017/05/20/legacy-of-1804-daniel-jean-louis-from-aid-to-trade-lof1804. You can also listen to the live broadcast at 714-242-6119. Daniel Jean-Louis ended up staying with us for the full two hours so we will address TPS and #NoHillaryatMedgar next week instead. Join me and Daniella Bien-Aimé of http://bienaimepost.com/ tonight at 9PM to discuss Kasav Tayino, Nan Sole's pilot self-determining agriculture coop in Haiti. Starting around 9:30PM, we will listen to clips from their fundraiser and information session in Brooklyn a few weeks ago, following which Jozye Ayisyen, one of the founders, will join us to take questions. From 9 to 9:30PM, we will welcome Paul Beaubrun who could not join us last week for our opening Pawòl ak Mizik segment. 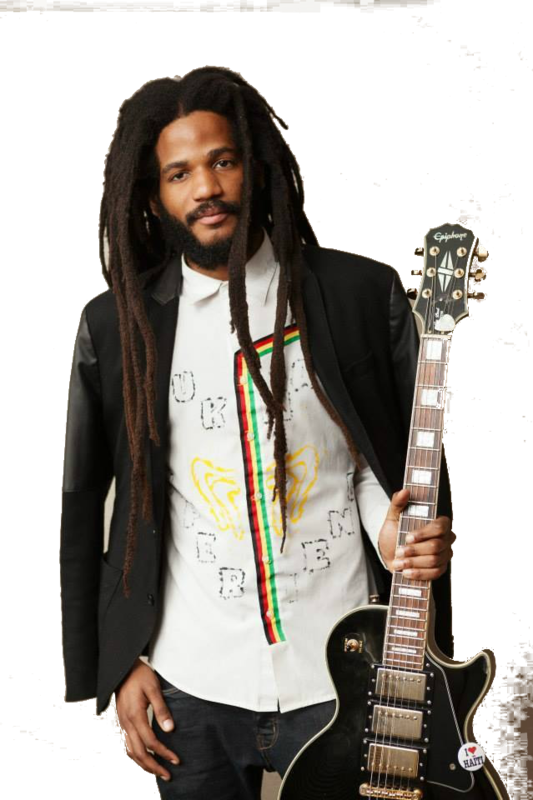 We'll listen to his music and discuss being a Beaubrun, the state of mizik rasin, his tour with Lauryn Hill, his latest album and his future plans. 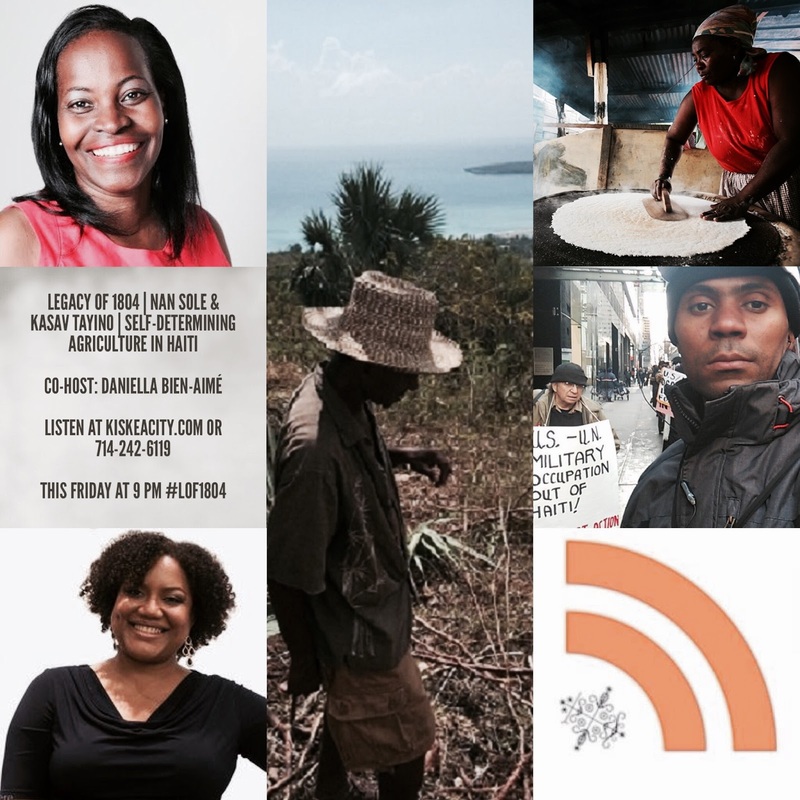 Listen at the player below or http://www.blogtalkradio.com/pancaribbean/2017/05/13/legacy-of-1804-nan-sole-kasav-tayino-self-determining-agriculture-in-haiti. You can also listen live only on the phone at 714-242-6119. Paul Beaubrun joined us from 00 to 00:30. Amazing energy! For the rest to the show we discussed Nan Sole. Jozye Ayisyen, a founder of Nan Sole joined to explain why he and 3 other Haitians came together to start a kasav production workshop in a remote part of Bainet. He stressed the need to move Haitian youth away from an ethos of migration to an ethos of production. Migration leads --as in the DR and Bahamas --- to denationalization, non-documentation and hence a lack of rights for Haitians all over the Americas and a loss of dignity for migrants. Conversely the void in Haitian national production means that Haiti now imports many products it could produce itself from the DR, a place where Haitians and their descendants are routinely mistreated. 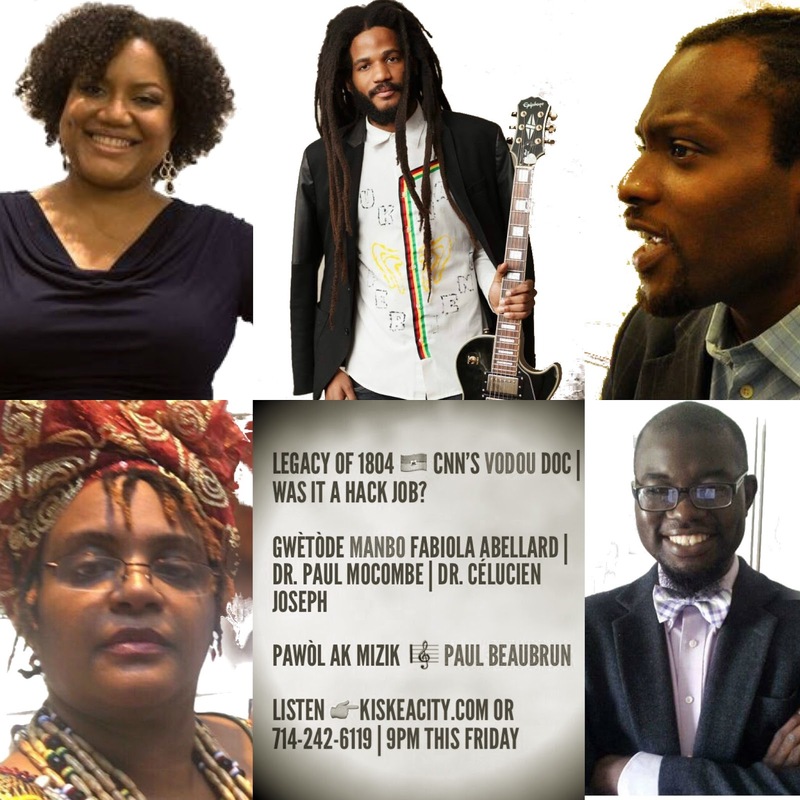 Listen live at the player below or http://www.blogtalkradio.com/pancaribbean/2017/05/06/legacy-of-1804-cnn-vodou-documentary-was-it-a-hack-job-lof1804. You can also listen live only on the phone at 714-242-6119. Paul Beaubrun was not able to join us but we played his music and will welcome him live soon. There were so many reactions to Dr. Joseph's article that we focused only on that and will reconvene to discuss Dr. Gilles' article on a later show. The extent of the christianity of the Kongo Kingdom before the transatlantic slave trade, given that a significant proportion of Haitians' ancestors came from the Kongo kingdom. Dr. Mocombe and Manbo Fabiola took exception to Dr. Lou's assertions that all the Kongos who came to Haiti were catholic. Rather, Dr. Mocombe believes that only their elites had converted to Christianity. | We also discussed the incessant persecution of vodouyizan in Haiti by the Catholic church initially and now by evangelical christians and the white supremacist ideology that fuels that persecution.| Dr. Mocombe and Manbo Fabiola also took exception to Dr. Joseph's assertion that Christianity and Islam are as ancestral to Haitians as is Vodou. | The issue of mental health in relation to vodou and to the perception of vodou by authorities in North America came up as well.